Three innovative John Deere concepts will receive gold and silver innovation awards plus a special mention at the 2015 SIMA show in Paris (February 22-26). “This achievement recognises John Deere’s commitment to innovation and advanced technology and is the result of excellent teamwork across the entire business,” says Chris Wigger, John Deere’s Region 2 Vice President, Sales & Marketing. John Deere’s ExactEmerge high performance planter concept provides new levels of accuracy at planting speeds of up to 10mph (16kph) and beyond. This innovative technology delivers seed to the bottom of the furrow in a rearward trajectory that truly matches the ground speed of the planter at any desired seed population. This delivers precise seed placement in the furrow with no bounce and no roll, whether planting maize or soya beans at high seeding rates. A cartridge of brush bristles gently cradles the seed on all sides, with full control, to deliver each seed to the bottom of the furrow, even in rough planting conditions. ExactEmerge row units handle the vast majority of seed shapes and sizes, achieving 99 per cent seed singulation. Featuring a road transport width of only 3m, John Deere’s eight-row high performance planter concept offers a granular fertiliser option and has been designed to work in both conventional tillage and no-till conditions. Mounted on a tractor, this unique electric-drive planter can be powered by an external generator attached to the tractor pto (or alternatively by a John Deere 6RE tractor), and is fully integrated into John Deere’s FarmSight range of precision farming solutions. John Deere has also developed the AutoConnect system, which is designed to fully connect a tractor to an implement without the operator needing to leave the tractor seat. By helping to save time when implements need to be changed, this new system provides a significant increase in productivity as well as improved operator safety. AutoConnect automatically links the tractor and the implement by establishing full functionality of the drawbar, PTO, SCVs, electrics, ISOBUS and air brakes. Activated on the tractor’s GreenStar cab display, the software modules AutoBackup, AutoConnect and AutoSetup enable a completely safe and quick connection to be made between the tractor and the implement. Enabling the use of high voltage electricity on both vehicles and implements, John Deere’s Battery Boost is the industry’s first tractor able to plug into the grid, and represents a major milestone on agriculture’s journey towards enhanced electro mobility. The innovative Battery Boost tractor concept utilises high performance batteries to preserve energy taken from a farm’s solar, biogas or wind energy plants, for use as a power source on demand. 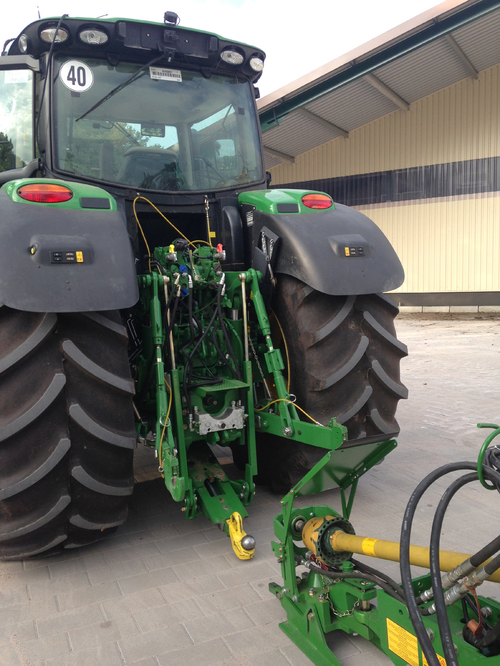 Connected to a modified John Deere 6RE tractor, Battery Boost can provide up to 107kW of additional power and enables the tractor to extend its power range, independent of the operating mode. Furthermore, the system’s AEF (Agricultural Industry Electronics Foundation) standardised socket unlocks new opportunities for agricultural e-mobility, manually or automatically controlled hybrid electric applications and bi-directional (DC) battery charging, which is additionally supported through CCS (Combined Charging System) socket integration. Key benefits of the easy to use, ‘plug-and-play’ Battery Boost system include a significant reduction in fuel costs due to the flexible use of sustainable energy produced on the farm, and the ability to use a lower rated tractor for applications where occasionally much higher horsepower would be required.